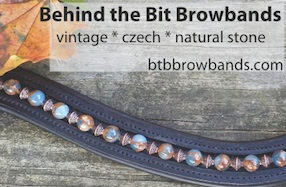 Behind the Bit: Equus Couture -- the bracelet giveaway is here! Equus Couture -- the bracelet giveaway is here! At only $35-45 each, these are very reasonably priced. You may have seen my earlier post about Equus Couture, a browband and leather goods booth at Devon. I bought four bracelets, one for a gift, one for the blog giveaway, and two for me. But on Saturday night at Devon, I ran into the would-be recipient of the gift bracelet--she was already wearing one! I'm only giving away one bracelet (sorry), but I can't decide which to keep. So when you sign up for the giveaway, please indicate which one you want. Sign up here to win one of the bracelets. I would choose the top one – as a gift for someone. They are both so pretty! Thanks for hosting the giveaway! You're awesome! I would pick the top one, but they are both gorgeous! Oh, my! Gorgeous!! You ARE awesome for presenting this giveaway. Oh, my! Gorgeous!! You ARE awesome for presenting this giveaway. Thank you!